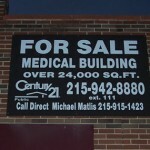 Aluminum or metal signs are used primarily for outdoor purposes. Unlike some other sign materials such as wooden signs, metallic signs can withstand the onslaught of harsh weather and remain in the same shape as the day it was created. When creating aluminum signs, we will apply computer cut vinyl letters or large format digital printing directly on top of the aluminum to create your sign. This allows us to have virtually any custom design for your specific needs. Our full color vinyl printing can create a truly amazing aluminum sign that you would have to see to believe. Metal signs have a large variety of uses for such things as construction sites, businesses which need to hang outdoor signs directly to brick walls, and for real estate signs which are placed into the ground. Aluminum signs come in a large variety of sizes and colors. Speak to us and let us know your aluminum sign needs!